Eagle Plains Resources is a Canadian based exploration and mining company with over 35 mineral exploration properties in western Canada. Eagle Plains has been operating since 1992 and publicly traded since July 1995. The management is made up largely of geologists with decades of experience and has a proven ability to develop joint venture partnerships. An in-house team of geologists and technicians enable us to manage this large portfolio of projects. The primary corporate objective is to enhance shareholder value by making precious- and base-metal deposit discoveries. To best achieve this objective we employ a risk-averse strategy to this risk-intense business by utilizing joint-venture participation. We also continue to add to our project portfolio by acquisition of early-stage exploration properties. Click on the link for an explanation of the grass roots exploration process. Eagle Plains properties include prospects for gold, uranium, silver, copper, molybdenum, zinc, lead, rare earth minerals, gallium and industrial minerals including sodalite and gypsum. Information regarding each of our exploration properties can be found on the projects page. You can sort the properties to be viewed by jurisdiction, mineralization type and availability for option. The majority of Eagle Plains mineral exploration properties have been acquired through staking during industry downturns, these include multiple projects that have had millions of dollars in exploration expenditures by previous operators. During the bull market of the late 2000's many of these projects were optioned to other companies, sold or spun-off. A table outlining these exploration project arrangements includes currently optioned and previously sold projects. Many projects have been optioned by other companies but not earned-in on and returned to Eagle Plains, the income/shares and exploration expenditures from these option arrangements are significant but not included in the above mentioned table. This contrarian strategy follows that projects are acquired when they are not in favor and sold or optioned when they are in demand. Project generators focus on the discovery stage of the exploration-mining continuum which typically provides the greatest opportunity for share price growth. The traditional approach by junior exploration companies is to finance exploration through repeated share offerings which results in dilution. Project generators, on the other hand, bring in a partner that earns an interest in the project by funding exploration. This results in a reduced interest in the project but greatly reduces the risk of exploration. In essence, it is a risk averse approach to exploration. Eagle Plains utilizes in-house research, TerraLogic Exploration Inc., and a network of prospectors to identify mineral exploration projects, this accounts for the current porfolio of over 35 projects. These were in large part acquired merely for the cost of staking. As a result of holding over 35 mineral exploration properties and with many of these under option to other companies, Eagle Plains Resources is considered a "Project Generator". Eagle Plains risk-averse exploration strategy is to employ joint venture participation to advance it's portfolio of properties. The intent of this model is to reduce the necessity of EPL share dilution while another company provides exploration funding as part of the option agreement earn-in process on a particular project. A typical option agreement consists of three components; commitment to explore between $3-5m over a specified amount of time, payment of a number of their shares to Eagle Plains and payment of a specified amount of cash to Eagle Plains. This joint venture model reduces exposure to the risk of exploration while maintaining a significant interest in the property in the event of a discovery. By combining our in-house mineral exploration expertise with the financial commitments of our partners as they earn-in, we add significantly to the annual efforts of our mineral exploration program. Click here for a list of option arrangements and their details. Revenue is generated by the company in a number of ways. TerraLogic Exploration Inc. is a wholly owned subsidiary of Eagle Plains which employs our technical team. This subsidiary conducts exploration services for Eagle Plains, our partners and 3rd party companies. This work generates significant revenue. Other sources of revenue include cash and share payments made by other companies to Eagle Plains as part of the earning in process of the option arrangements. Eagle Plains purchased an office building in Cranbrook, B.C. as it's headquarters and leasable commercial office space. This transaction took place during the general realestate downturn that resulted from the economic collapse of 2008. Near the same time Eagle Plains also acquired a farm on the outskirts of Cranbrook and converted it to a geological processing facility, further adding to our revenue generation and reducing the costs to the company for services associated with this. Below is a chart depicting annual exploration expenditures on Eagle Plains projects by Eagle Plains, our Option Partners and Teck during our Strategic Alliance. Finally, the 3rd party operations amount is the value of work that Terralogic Exploration Inc. has conducted for third parties. Services provided to these third parties create revenue for Eagle Plains but are not expenditures on EPL projects. A strategy to create shareholder value is to spin-off successful exploration projects into new companies. This spotlights the value for the market and simplifies acquisition for producing companies. An example of this was the creation of Copper Canyon Resources (CPY) in 2006, Eagle Plains shareholders received this new share on a 1-for-1 basis. CPY was then purchased by NovaGold Resources in 2011, and as part of the arrangement, the remaining assets of CPY were then spun into a new company for the shareholders, Omineca Mining and Metals. 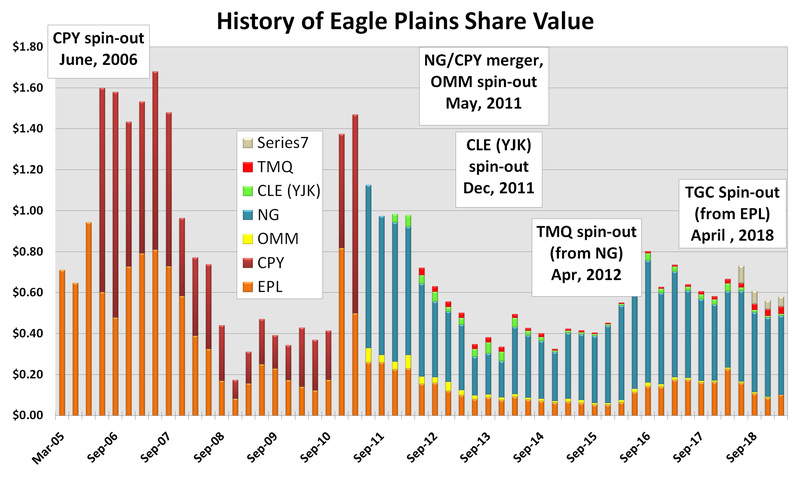 The chart below depicts the value of Eagle Plains shares over the years if purchased prior to the spin-out of Copper Canyon Resources in June 2006. It includes the value of Clean Commodities Corp. (CLE) which was spun-off in December 2011 as Yellowjacket Resources (YJK). See notes below chart for details. - June 2006 Eagle Plains spins-off it's most developed asset, Copper Canyon, into Copper Canyon Resources (CPY) on a 1-for-1 share basis to existing shareholders. Only weeks prior to this spin-off Eagle Plains was trading near 70 cents, after the spin-off Eagle Plains contiinued trading near 70 cents while CPY began trading at $1.02, a 245% gain in value. - May 2011, the Copper Canyon Resources shares were acquired by NovaGold Resources on a 13.6 CPY to 1 NG share ratio and CPY shareholders also received a new share, Omineca Mining and Metals (OMM) on a 1-for-4 basis. This arrangement was worth approximately $65 million to Copper Canyon shareholders at the time it was approved. - December 2011, Eagle Plains spins-off Yellowjacket Resources (YJK) on a 1-for-3 share basis to existing shareholders. Yellowjacket Resources has been renamed to Clean Commodities Corp. It is currently under different management. - April 2012 NovaGold spins-off NovaCopper on a 1-for-6 share basis. - April 2018 Eagle Plains spins-out Taiga Gold Corp. on a 1 for 2 share basis, this is indicated in blue on the above graph. Eagle Plains stock trades on the TSX Venture Exchange (TSX-V) under the symbol EPL. In April 2018, Eagle Plains Resources spun-out 5 properties in the vicinity of SSR Mining's Seabee Gold Operation in northeastern Saskatchewan into Taiga Gold Corp. resulting in 1 TGC share for 2 EPL share split. For accounting purposes the adjusted cost basis (ACB) of the Taiga Gold Corp. share is to be 30.34% of the pre-split Eagle Plains share purchase value. In Dec 2011, Eagle Plains Resources spun-off it's Yellowjacket Project into Yellowjacket Resources, resulting in a 1 for 3 share split. For accounting purposes the cost basis of the Yellowjacket Resources share is to be 31.58% of the pre-split Eagle Plains share purchase cost. The company has been renamed to Clean Commodities Corp. to reflect its focus on lithium exploration. In June 2006, Eagle Plains Resources spun-off its Copper Canyon , Abo and Severence properties into Copper Canyon Resources, resulting in a 1 for 1 share split. For accounting purposes the cost basis of the Copper Canyon share is to be 59.35% of the pre-split Eagle Plains share purchase valiue. We have retained an independent & informal opinion of the tax implications to our USA shareholders as a result of the plan of arrangement.